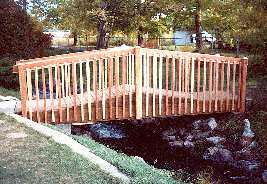 This custom bridge replaced an existing bridge that had sunk down into the stream bank causing severe deterioration. The homeowner built the original bridge using only two joists. 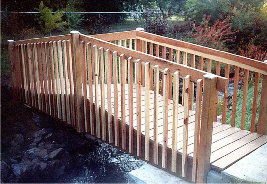 The new bridge features four pressure treated 2x10s, cross bracing, Trex no maintenance planking with a redwood railing. The slope is to help clear the ice and snow. This is one example of the custom work BMC is capable of. We actually enjoy the unusual custom.